When we create starter decks for our Block expansions, we have developed a series of rules and guidelines that we follow that guide their construction. For example, starters are as close to the minimum deck size as possible (30 cards in the draw deck), and the decks are built to follow the play 2 / draw 2 model. We only use eighteen (18) dilemmas. We work as hard as we can to minimize complexity. All of these rules are meant to make the starter experience familiar for players, especially new and returning players. We want a player to learn how to play with the TNG Federation starter, and then be able to use those lessons when they switch to the TNG Ferengi starter or the DS9 Dominion starter. But some of the more interesting rules guide the mission selection in the starters. Have you noticed that every starter in a block overlaps a mission with every other starter? This rule was put into place to ensure there would be some chance for interaction in every game. Likewise, we have included a 40-point mission and a universal mission in each starter to allow for interaction via mission stealing. It's with this rule, and the need for a universal mission for the Dominion starter, that Probe Alpha Quadrant System was born. Jason Drake was tasked with most of the work on the Dominion starter, and created the first draft of PAQS. It was universal, Alpha Quadrant, worth 30 points, and required Navigation + Stellar Cartography + (Vorta OR Dosi) - all of which survived to the final version. The biggest difference was the affiliations: . Dominion was required so the Dominion could attempt the mission; Non-Aligned is generally frowned upon on missions by Design these days, but was required so that all of the other starters could have a chance to steal the mission. Of course, the problem then became the requirements, as it was extremely unlikely that any of the other starter decks would ever been able to get a Vorta or a Dosi into play. This necessitated the first change, adding 2 Diplomacy as an option to the requirements. At that point, the mission was finished. We'd handed it off to Creative to begin drafting a story, and we could have ended there. But there was an idea in the back of my head that I thought might fit this card to a T - adding the Delta Quadrant affiliations. 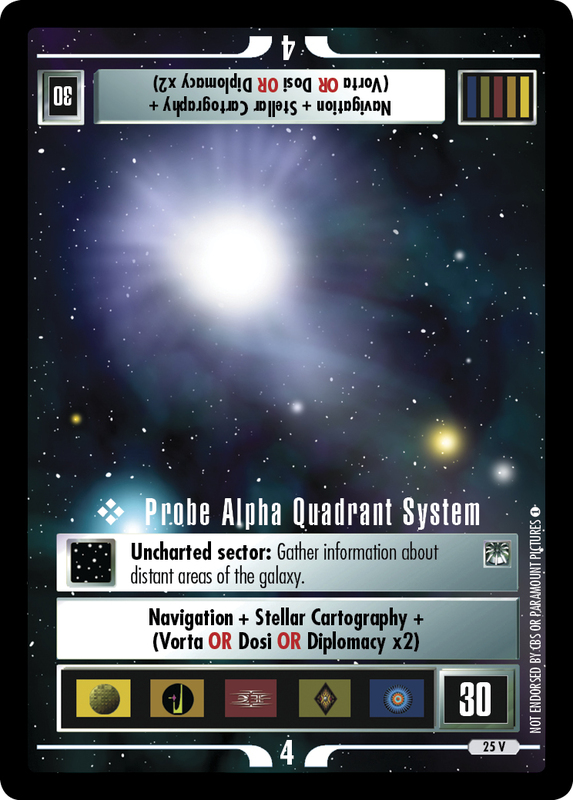 One of the most common requests / complaints I hear is that there is no way for a native DQ affiliation deck (a pure Hirogen, Kazon, or Vidiian) to complete an Alpha Quadrant mission to get around You Are a Monument. I felt that Probe Alpha Quadrant System was an ideal opportunity to fill this need and give the DQ natives a mission they could use without jumping through extra hoops. After some debate, the design team agreed and with some Creative redefinition, the first non- mission featuring the , , or icons was born. Will you use this mission in your next DQ affiliation deck? Sound off on the forums and let us know!